Fiddle 2-3 students will add to their Canadian fiddle tune repertoire while developing style and technique. Fiddle music and dancing go hand in hand, so expect to move and learn some basic dance steps, including the waltz, 2 step, foxtrot, schottische and more. Please bring a music stand, pencil and paper to class. Paul has experience teaching the Calgary Fiddlers and Bow Valley Fiddlers, as a private music teacher, and as a camp instructor at the Silver Creek Fiddle Camp for the Alberta Society of Fiddlers and at FAMI. Paul started playing classical violin at the age of eight and began fiddling at twelve. For four years he played with the fiddle group, Bow Fever, and travelled with members of this group to Nova Scotia. There he performed at the Dartmouth Maritime Fiddle Contest and at a number of concerts and ceilidhs. 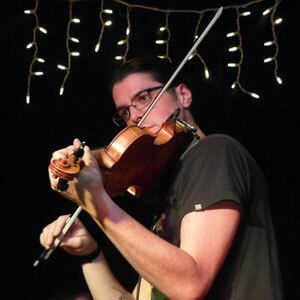 Paul has attended numerous fiddle camps and workshops, jamborees and contests. He has achieved success at the Wetaskiwin Jig and Reel Contest and the Grand North American here in Alberta. In 2005 Paul was invited to compete in the Grand Masters Fiddle Contest in Ottawa. Paul's musical interests are wide-ranging. He currently holds the position of Performance and Artist Programs Manager at the National Music Centre and teaches music business at Beat Drop Music Production and DJ School.